Just finished reading this easy to understand nuts and boltsy book. A feature film producer I'm working for recommended I give it a look see. Full of great tips for the beginner to intermediate level amateur crowd. The author tells you what to avoid to get past those pesky development readers. I dig the litany of straightforward advice to simply avoid sucking. Chock full of useful things to make a good impression at the studio system entry level. Loaded with fun to read screenplay examples to illustrate the lessons. A very breezy read and already applying lessons learned in my current assignment. I have a few books on screenwriting. Can't say I have read them though... Pretty much the only one I have read is that one!! Yeah, I read that one when I was doing my first script. Solid stuff. One I really recommend is Story by McKee. That's one you can go back to several times and come away with something different each time. I have this next to my bed and have been meaning to read it but so far have found lots of reasons not to. Knowing it is decent at least takes that excuse away. This one and the Goldman books have served me well. If you have to pick just one, I think you made a solid choice! Checking out Pen Densham's career strategy book next. More amusing than helpful -- I can recommend it for the former more than the latter -- but it does read lightening quick, as it is more a collection of anecdotes than anything else. It is safe to say that Eszterhas is madly in love with Eszterhas -- and half the book actually reads like one long post from our pal, Balt -- so that kind of makes it even funnier in a way. Eszterhas' autobiography 'Hollywood Animal' is entertaining as well. He slags off Mckee alot, which is always welcome. I checked this one out recently at the library. Worth checking out if they have it at your local branch. 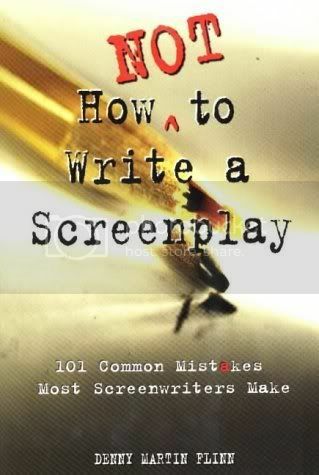 Writing the Character Centered Screenplay by Andrew Horton. I like reading discussions that are contrary to some of the things we normally think or assume. What I took from this was a consideration of what we need to know about a character's history. Not just the audience, but even the writer. One would maybe assume that the more we know about a character, the more that character is fleshed out, the more depth the character has. Kind of like a person's personality is the sum of its parts, the experiences that shape him. Horton points out that this is not quite true. Even with people in your real life, does knowing everything about their history necessarily help you know them better? does it necessarily determine their actions? Horton points out that while it is useful to know some of a character's formative experiences, we also want a level of mystery. Sometimes characters do things not because of something that happened to them in their past, but simply because it's who they are. And as with real people, there should be a level of unpredictability to a character's actions. He calls this carnivalesque. He compares it to a New Orleans Mardis Gras procession which has a rhyme and a rhythm, but does not march according to a planned path. They wander where they wander. He examines Silence of the Lambs. The Jodie Foster character is revealed through discussions about her father, a cop killed in the line. This explains much, but not all of the character's motivation. On the other hand, Lectre, one of the more interesting characters in film history, is someone we know next to nothing about regarding his past(not in the original film anyway). It's a good read, a quick read. It's changed some of my thinking on character construction...not that it means I write good ones now! Sounds like "500 Ways to Beat the Hollywood Script Reader"
Reading this right now, and it's absolutely amazing. There are a few debatable points, but overall it's been incredibly insightful. Only 50 pages in and I've learned so much. Highly recommended. Cat Match [dot] Com - FILMED! Just ordered my copy! Thanks for the recommendation ED and thanks for making the book the link to the Amazon page! Interesting - don't think I have come across this one. Will need to pick it up. Whenever I'm in need of some refresher's and inspiration, I read Stephen King's "On Writing" book. It's not necessarily about screenwriting, and not everyone is a fan of King, but I find it very informative. Especially how he breaks things down into a writer's "toolbox." @ Mac...I LOVE, LOVE, LOVE "On Writing". I read it then bought it on CD and listen to it in my car.